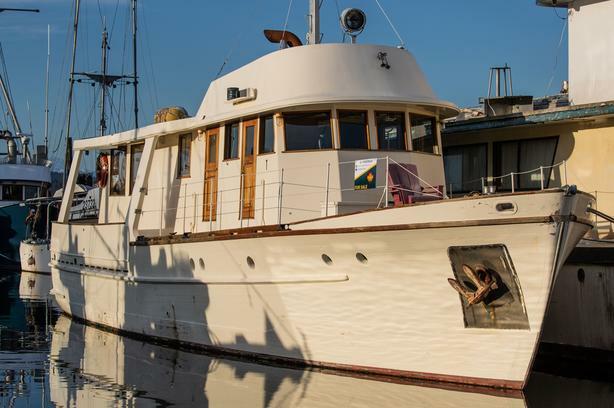 1957 Carvel Planked Wooden pleasure craft is an ex RCMP patrol vessel that has been professionally built by McKay - Cormack shipyards in Victoria B.C. It has a raked stem, rounded bilges to a long keel and curved transom. Two single berths forward located in the foc'sle and aft of the foc'sle is an enclosed head with a shower followed by a double berth to port. Stairs lead up to the wheelhouse and aft of the wheelhouse is the galley, salon with dining/lounge. A single door leading aft to the outside deck and stairs to starboard lead down to the aft cabin with an enclosed head/shower. This vessel can sleep 6-10 people comfortably. Powered by a V-12 Cummins diesel engine that has been rebuilt. Last survey performed March 10th 2015 resulted in the value of the vessel with all equipment at a peak evaluation. Propeller : 36" x 27 - 3 Blade Bronze, 2 1/2" Monel shaft, bronze stuffing box. Bilge stringers - purple heart sole plate.